Kelvin Wong is the author of Create Your Destiny, launched in 2003 across all major bookstores in Singapore including Kinokuniya, MPH, Popular and Times. Create Your Destiny was listed in the “Business Bestsellers” section of Kinokuniya bookstore in Singapore the following month. Kelvin Wong researched and examined the principles of many successful network marketers before publishing Create Your Destiny. This book aims to shorten the learning curve of new network marketers who aspire to build successful network marketing businesses to achieve their desired lifestyles. Create Your Destiny lays the groundwork of a duplicable system that is crucial to the success of your network marketing business. The exercises included in the book are designed to clarify your purpose in life and to establish your belief in network marketing. You will be guided step-by-step through the process of penning down your dreams, goals and commitments. You will also learn about the traits of successful network marketers and the common misconceptions of network marketing. Apply the proven strategies and embark on an exciting journey to a happy, healthy and wealthy life! Bestselling Author of So What If You Don't Have A Degree? and No Job? No Problem! If you want to achieve financial success, you’ll need sound financial literacy and practices. As money management skills are never taught in schools and rarely imparted to us by our parents, not many have high financial IQ. This book teaches you to be a good money principles. You’ll learn how to recover from debts and how to manage your money and grow your wealth. Don't fall into money traps with poor money practices. If you apply sound financial principles faithfully in your everyday life, you’ll soon realize that the possibility of achieving financial freedom and even moving on to become a millionaire could well be within your grasp! Many people are clueless about money matters and face an overwhelming task of money management. Financial problems cause devastating stress in a relationship and are responsible for the breakups of many families. This book teaches couples to work together to create a rich future. Readers will learn how to communicate effectively with their spouses about money, with practical financial tools included to assist couples in joint financial management. Couples who plan, manage and grow their finances together would harvest financial rewards and could even accelerate to become the next millionaire couple! Do you know that the rich have always invested in properties? Real estate investments should never be overlooked if you want to become wealthy. Kelvin, landlord who owns a multimillion portfolio of properties in different parts of the world, shares his real estate investing experience and strategies that have helped him achieved phenomenal success. 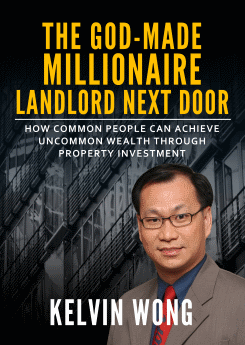 This book is for people who aspire to be millionaire landlords. Don't commit the common and costly mistakes make by most novice property investors. Learn the time-tested strategies and live the life of a millionaire landlord for yourself!